Addis Ababa, Ethiopia (ADV) – It is a historical flight for Ethiopian Airlines on Friday when it resumed commercial services to Mogadishu exactly 41 years after it last took off of there. The resumption of the flight service to Somalia follows Prime Minister Abiy and Somali President Mohamed Abdullahi Mohamed’s agreement to strengthen relations between the countries in June this year. The move comes three weeks after a plane from the private airline, Ethiopia National Airways, landed at Mogadishu’s Aden Adde airport. Shortly after landing, the Ethiopian Airlines Group CEO Tewolde Gebremariam said the company had been fully convinced that Mogadishu was “peaceful and secured now”. The suspension of Ethiopian Airlines stems from several conflicts between the two neighbors over a disputed territory. Tewolde said Mogadishu was the carrier’s 117th destination and pledged it will fly three times in a week to the Somali capital. 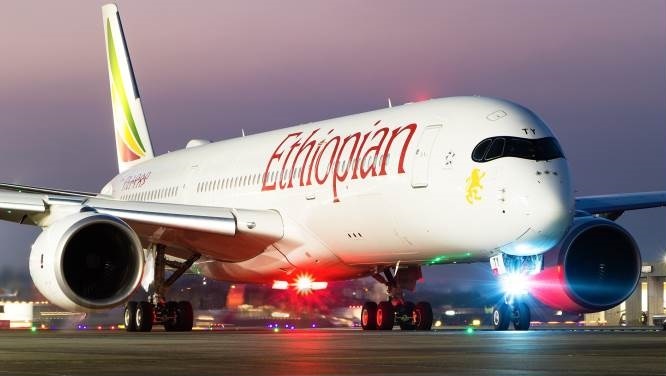 According to the CEO, the flights will play a big role in strengthening people-to-people and economic ties between Ethiopia and Somalia, enabling Somalis in Americas, Europe, Asia, Middle East and other parts of Africa to fly to their homelands through Addis Ababa. The entry of the Ethiopian national carrier on the Mogadishu destination makes it the second major international carrier after Turkish Airlines to operate in Somalia.